It’s what you do when you’re in this kind of situation that determines whether you are mature or not. Immature girls will keep quiet because they don’t want to be thought of as the odd ball in the group, or the religious fanatic. They want to be liked by their friends so they keep quiet. Is that really how we should handle tough situations? What would the Lord Jesus want you to do? Christ wants us to obey His Word … period! If a friend talks about getting an abortion, you may be the only one God puts in her path to talk to about it. If your friend wants you to cheat on a test with her, take a stand. 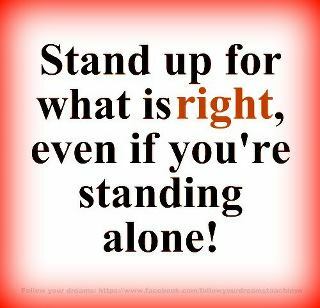 There are times that we just have to stand for what is right. It’s not easy – it may cause pain – you may even lose friends. But doing the right thing will always produce good results – maybe not today, but in the end.